This is a UH-1-style collective head. Its dimensions are based on the measurements and photos found on the Internet, it’s almost scale. Mode switch is installed in a place of a light bulb, as it’s much more useful in this case. In its default software configuration, it’s set up in a way so you can assign switches of the DCS Huey’s head to it. It can also start a DCS Huey (it will operate its throttle below idle stop detent). Note: if you’re starting a flight cold and dark, your throttle should be closed for this feature to work properly! Carefully remove supports. 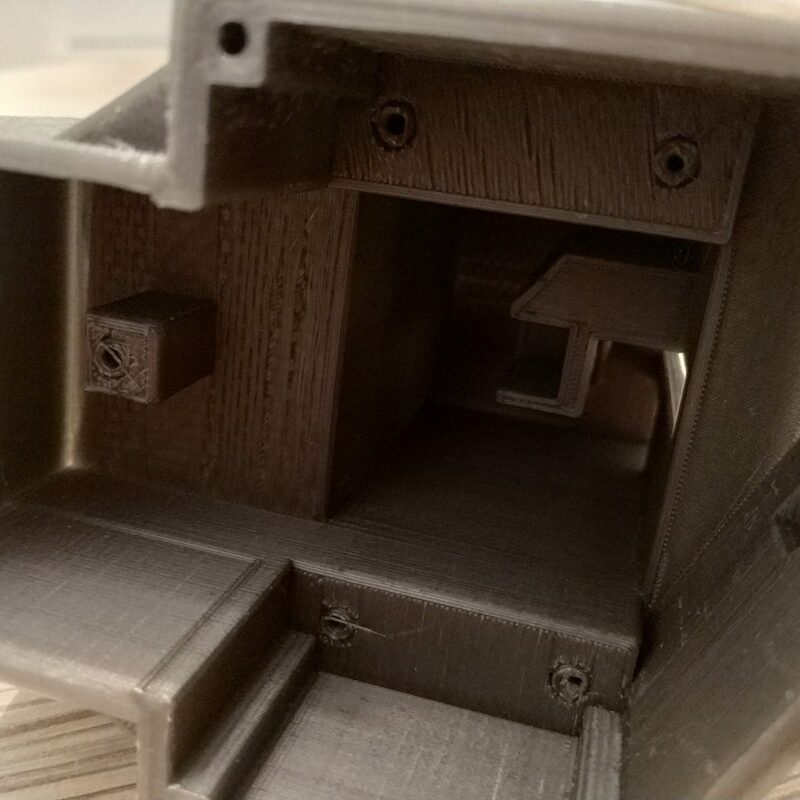 Note that inside of the housing there are internal structures that, in theory, can be broken accidentally (though they have been strengthened to avoid that). Press-fit nuts into their sockets on the bottom of the head. Insert switches to the housing cover. Two switches in the bottom should be spring-loaded type ( (ON)-OFF(ON) ), two upper switches – toggle type ( ON-OFF-ON ). Break pin parts with screws off the switches. It’s time to heat up your soldering iron and a glue gun. 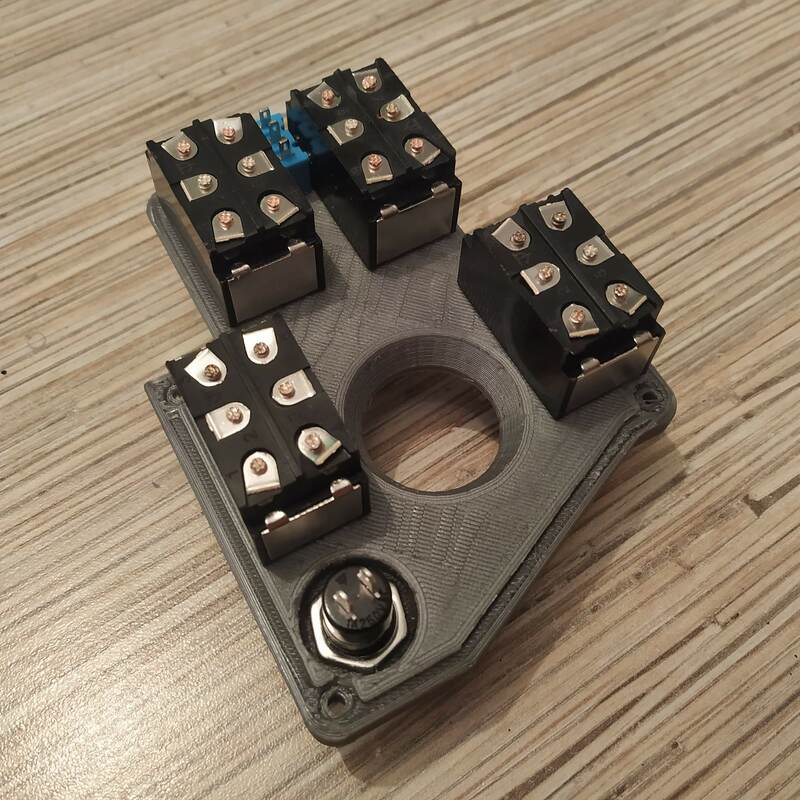 Put some solder onto contact pads of the switches (don’t forget to use some flux). 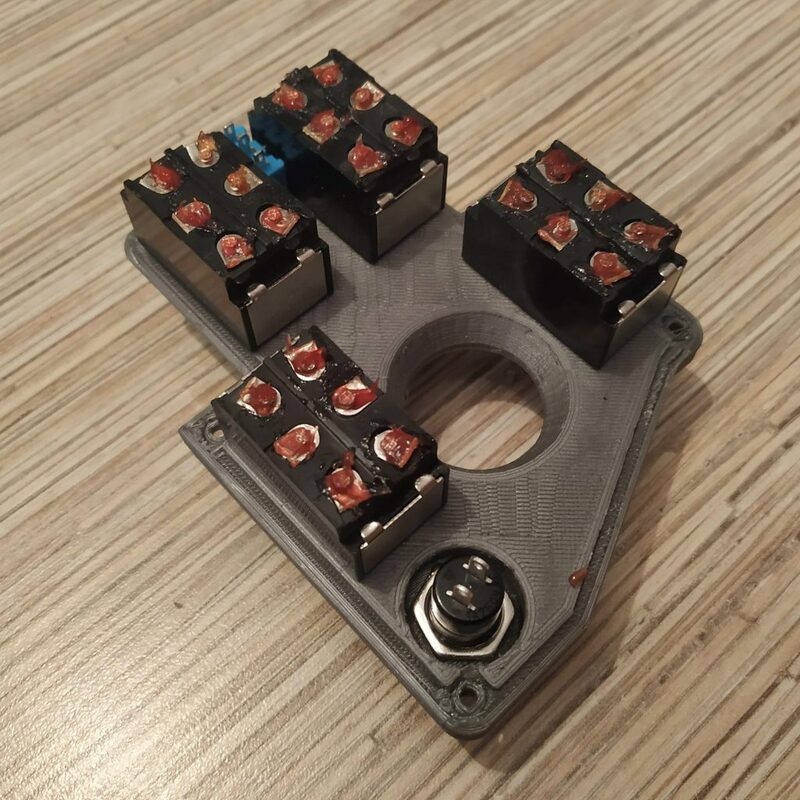 Be careful – do not overheat switches too much. Cut a wire off the ribbon cable, and connect ground (middle) pins of the switches and the button together, as shown on picture. Cut a 12-wire cable off the ribbon. Solder wires one by one, following numbers on the picture. The last wire will be the ground one. Use the same contact pads row where the ground wire is. Fix stuff with hot glue so it won’t move. Solder 5-wire cable, cut off the ribbon, to the pot board. Put it onto its frame, fix with 4x M3x10MM screws. Solder UART header to the Pro Mini. Starting from pin0, solder the 12-wire switches cable to Pro Mini’s digital pins. 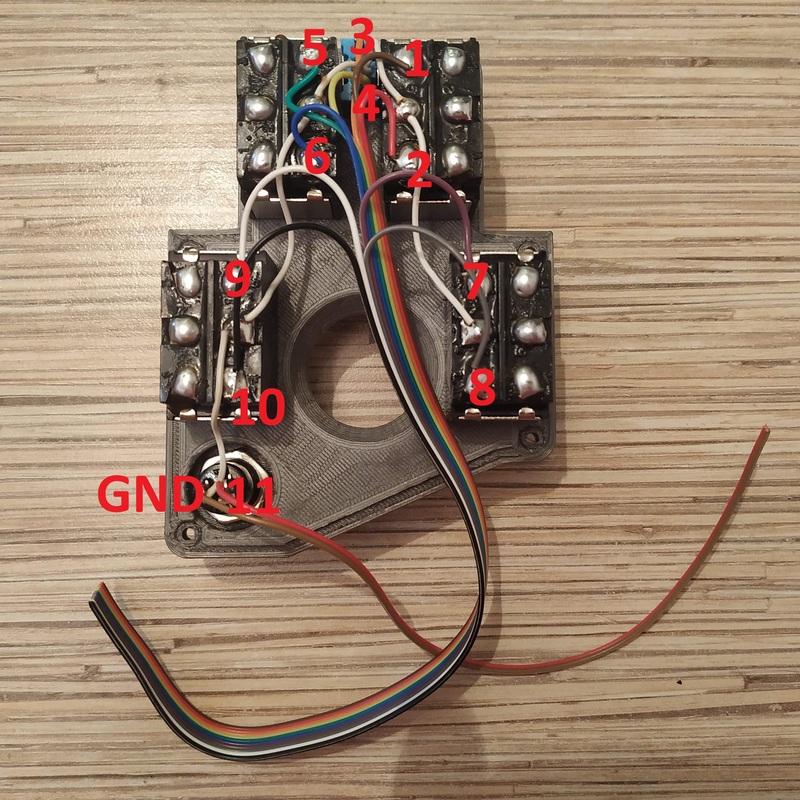 The wire of the button should go to pin10, and the last wire of the cable should go to the GND pin near it. 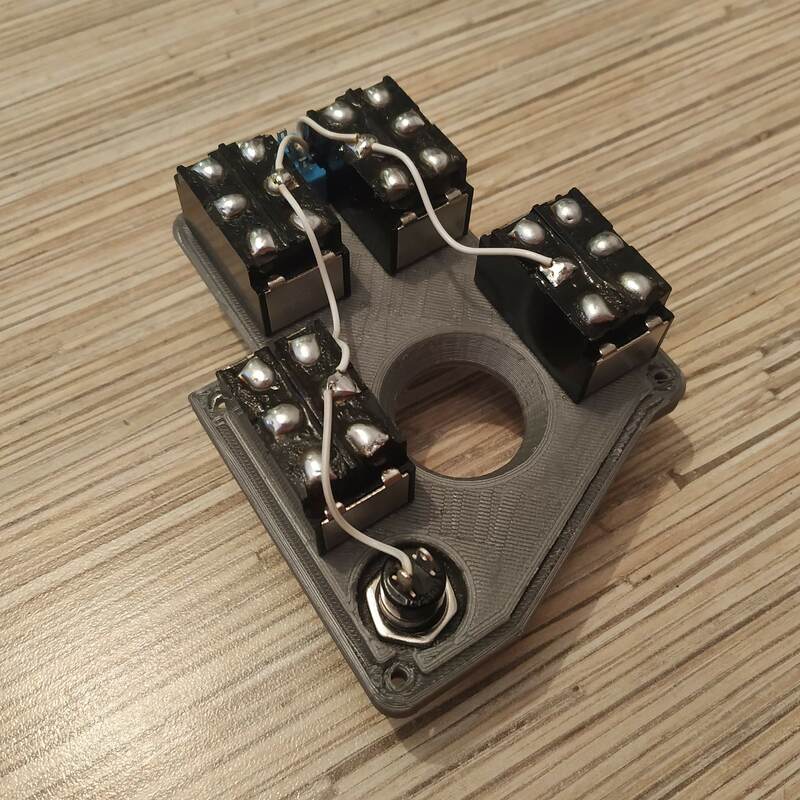 Bend legs of PBS-10B2 button as shown on picture and solder long enough wires to it, then insert it into its socket in the lower part of the housing, fix with its nut (rotate it with pliers or a knife, tighten as possible). Use tiny drops of hot glue on both sides of the button to fix it in place. Solder 4-wire cable to 1st 4 pins of an Ethernet socket. Cut off unneeded pins. Bend remaining pins so they won’t protrude too far. Press-fit the socket into its slot and check that wires are still connected to the socket with a multimeter. If everything’s ok, pour a fair amount of hot glue to fix it in place. Solder one of starter button’s pins (PBS-10B2) to pin11, another one – to the ground. Use a spare GND pin of the UART header on the Pro Mini, or some switch’s central contact pad (the same row where wires are soldered!) at your discretion. That’s it! Time to flash Pro Mini board! Uncomment “Serial.begin” line and lines under “\\DEBUG” line. When flashing, make sure that all switches are centered. 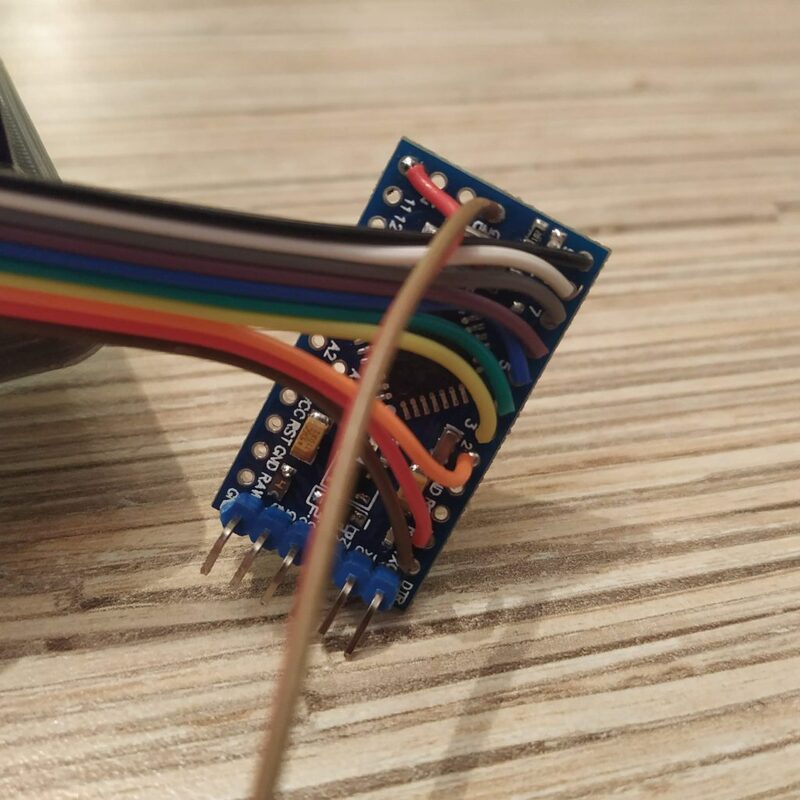 Something around 128 in two last numbers means your potentiometers are connected properly (0 or 255 means there’s a problem!). 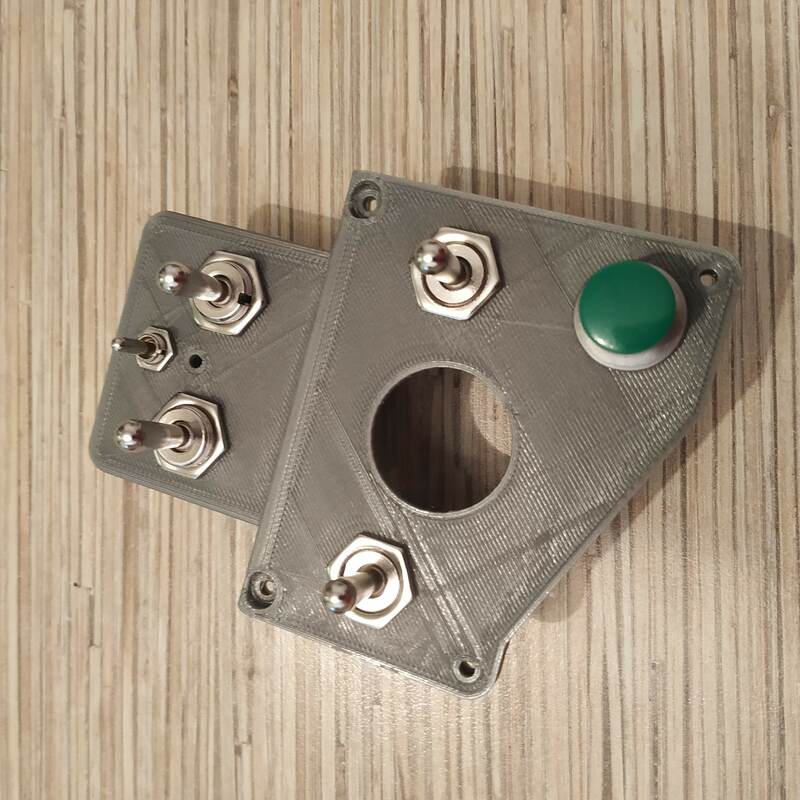 Flip all switches and press all buttons (including the thumbstick button! ), you should see 1s popping up in the line. Note, that the left upper switch in its lower position will temporarily cut off serial port communication, that’s fine. Just flip it back to continue. When you have checked all switches and buttons, comment out “Serial.begin” line and lines under “\\DEBUG” line and re-flash the firmware. Put everything together! Use 4x M3x50mm screws for fastening the lid and 4x12mm screws for the pot board frame. Insert the starter trigger and fix it with an M3x30mm screw. Drill out its hole if needed to make it rotate freely. If its travel range is too short, file the lower edge of its slot just a bit. Congratulations! Your Huey-style collective head is ready for a test flight! Hello! Thanks for the amazing new manual! 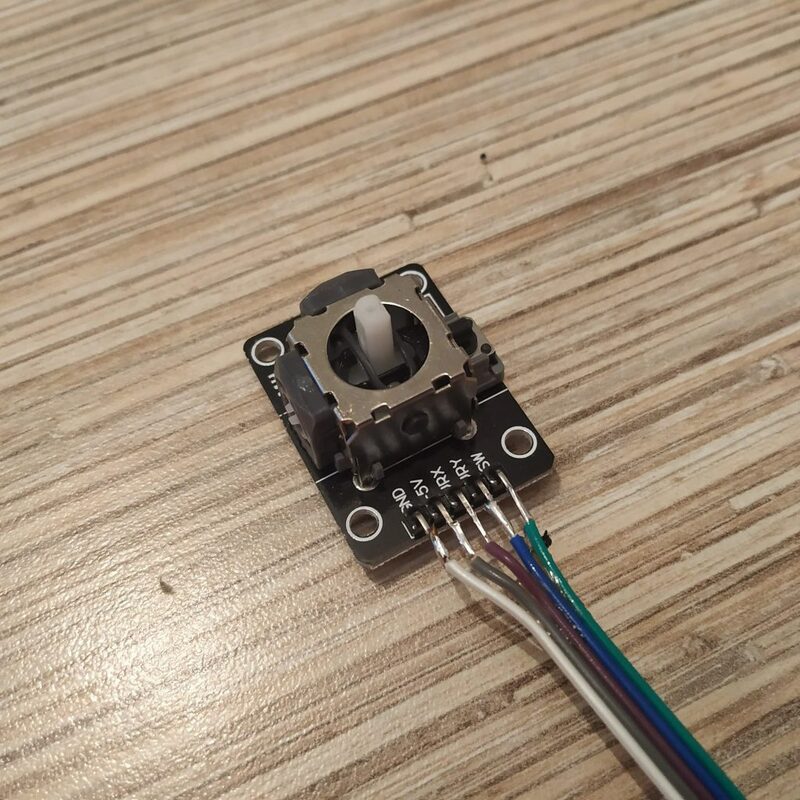 Could you please help me find the parts on aliexpress or Amazon.de? alternatively, you can just use the same switch you use for 2 upper switches. It’s better to have 2 different types for the sake of usability in all scenarios, but it’s perfectly ok to use what’s at hand. You can always replace switches and buttons to suit your needs. Well, I spent hours with sanding and adjusting the parts for the head, yet there must have been some distortion problem during printing. Everything is off by a small amount (0,5-1mm). After hours of sanding and adjusting every single hole and having to recut/regrind every space for the nuts it still is not fitting properly together. 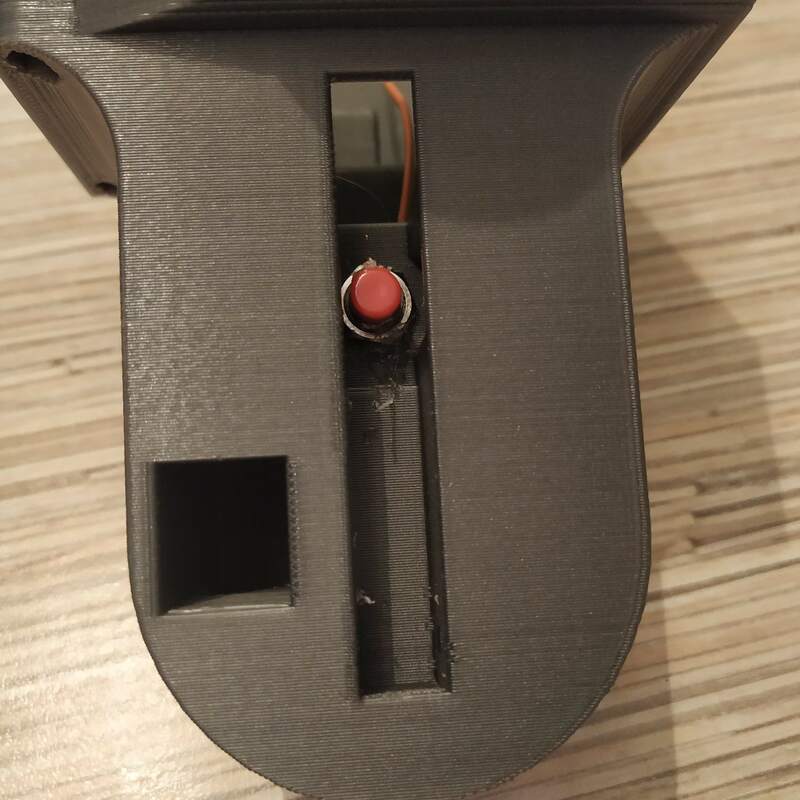 The last straw was when I tried to mount the joysticks onto the little plate and the spacers just broke off because the holes and everything was off by 0,5mm. I decided that there was no space in my life for that kind of crap, so it went into the trash and I decided to make a new start. 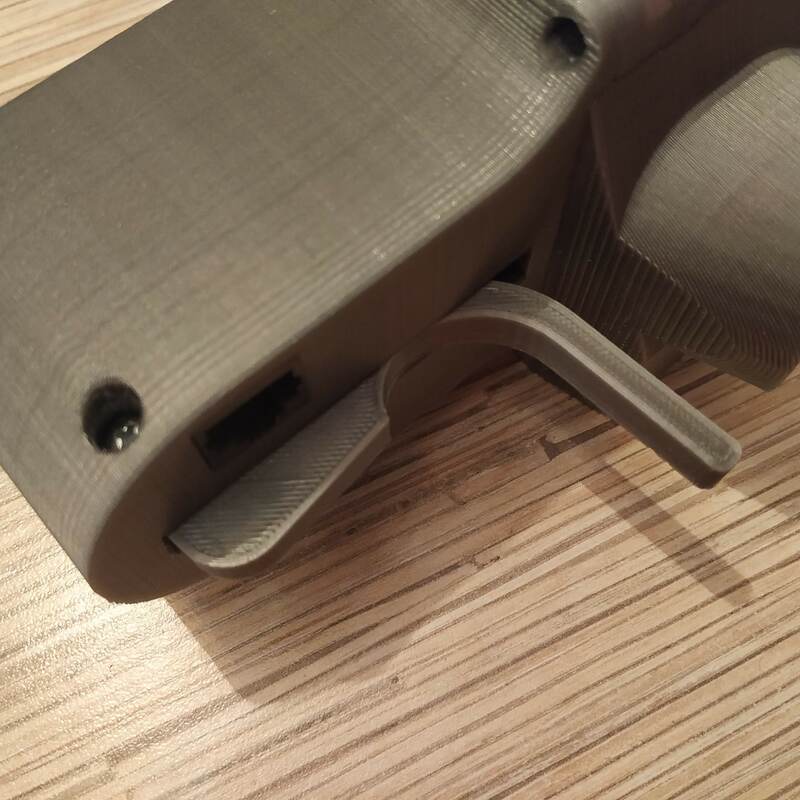 Thanks to your help I was able to source replacement parts which should fit nicely. I will keep you informed. Hmm, at what temperature do you print? You may need to make a chamfer for nuts etc with a knife. I usually press fit nuts with pliers (you have to press them in, they won’t just fit into sockets without slight force application), you can also use a 3mm screw to press-fit them. Just screw it from the other side (use a washer to avoid bending plastic). One more thing to keep in mind, the 1st layer is usually wider than others, so you may need to cut stuff a bit. Increasing fan speed can be another thing to try, it will reduce shrinkage (yet can make parts brittle). Anyway, 1mm is a bit too much. 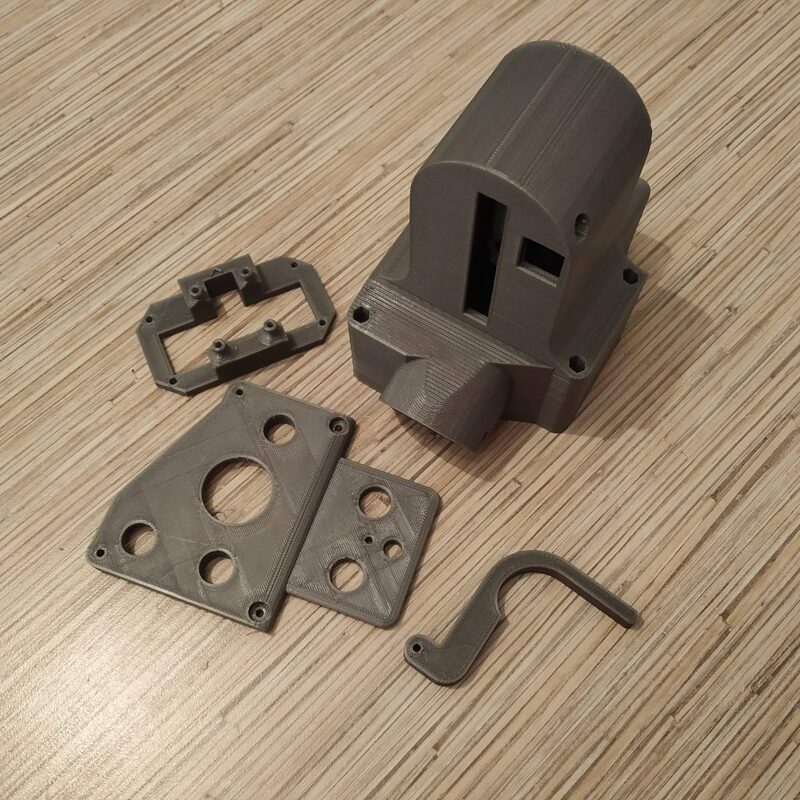 Tolerances for everything are 0,4 – 0,5mm, that’s pretty tight fit, but not too tight to have problems with fitting stuff. Hey there, nice to have the detailed manual. Thanks! I am almost done. Just hooked up the head with the board. My problem is that as soon as I switch the SL to STOW the output of the board stops. Switching it back in the middle position turns the outut into a weird clash of signs. SOmetimes it switches back to the number output. Measured all connections. No problems, no cross connections. That’s perfectly normal! The reason for this is, that pins 0 and 1 are actually used for serial port communication by the board. So when you flip the switch, you ground one of these pins, that breaks the communication. It means that the switch works. Basically, you want to see that every switch flip or button press causes some changes in output, that means it’s fine electrically. Note, that the left upper switch in its lower position will temporarily cut off serial port communication, that’s fine. Just flip it back to continue. Thanks. SOrry for the dumb question. Just read it after checking the manual 3 times. Now I am done with the whole manual. Everything works for the slave now. I also hooked up the slave to the master and followed your manual on the software page. Is there a way to check the slave whilst being hooked to the master? Note that mode switch (the small one in the place of a light bulb) should be centered, due to some weird joy.cpl limitations – it can display only first 32 buttons. 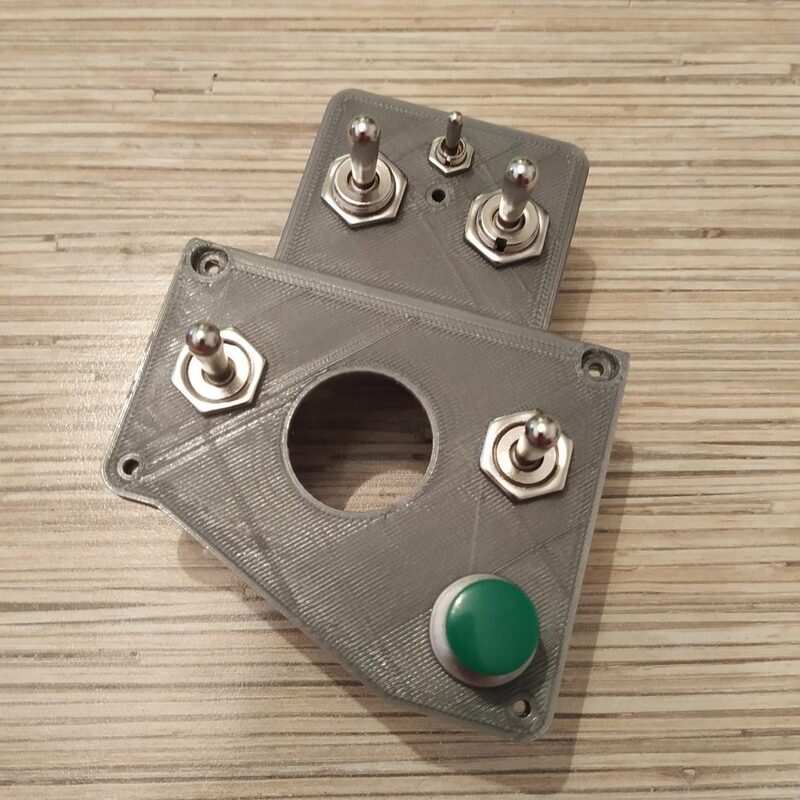 To see all buttons in action (with mode switch in other positions) you can use Pointy’s joystick tester. Heads pop up as a 3rd Arduino Leonardo in the list. 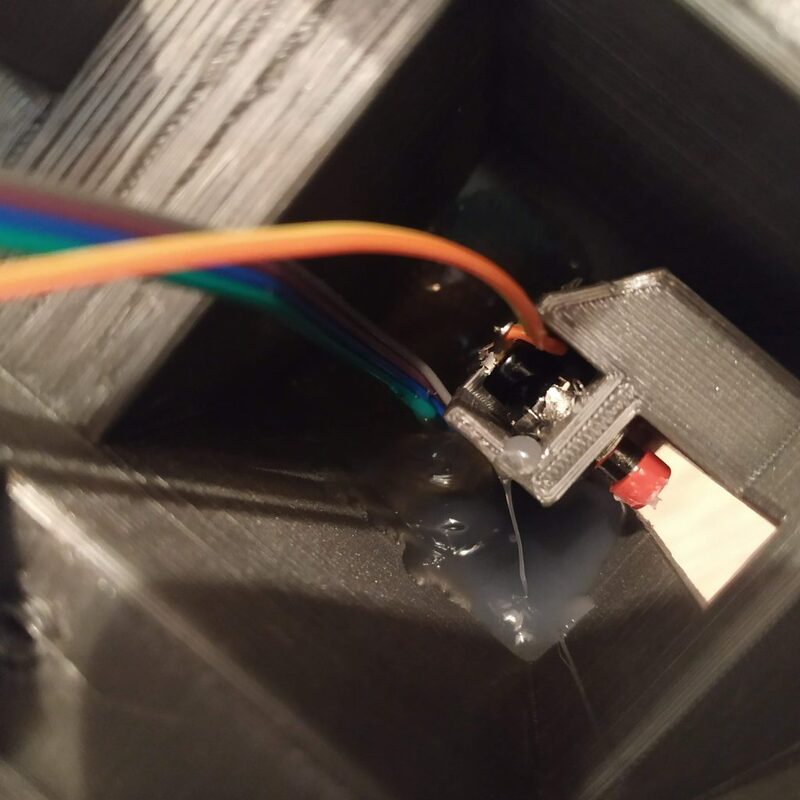 Don’t forget to comment out Serial.begin and Serial.prints in the slave firmware and reflash it (printing to console slows things down considerably)! The same happens if I connect only the head to the IC2 box. Also, if I connect head+IC2 box and then plug in the USB cable, the Arduinos don’t even appear in joy.cpl. I am at a total loss… what could be wrong? Can you give me some pointers? 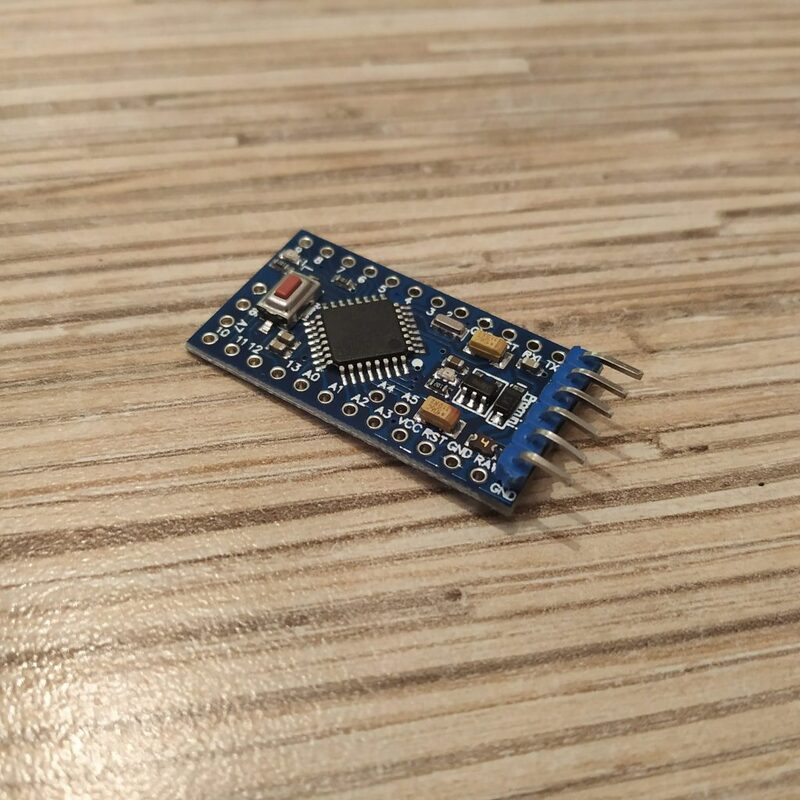 From what I can think of, most likely you may have accidentally swapped I2C pins of the Pro Mini, connecting SCL wire to an SDA pin and vice versa. The white-green cable (SCL) should go to pin A5, and the blue one (SDA) should go to A4. It can be a bit confusing as in other boards, an SCL pin usually comes first. Strangely it seems I have missed it in the manual somehow. The problem may also be on the lever side! 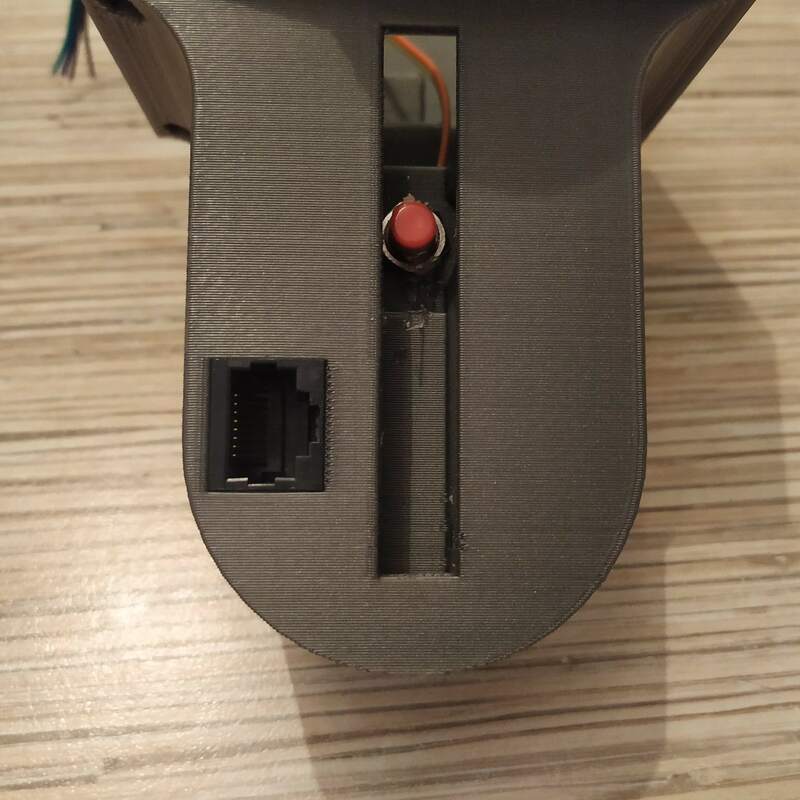 Try checking the head separately by connecting it to the controller directly. Anyway, don’t worry, you’re almost there. 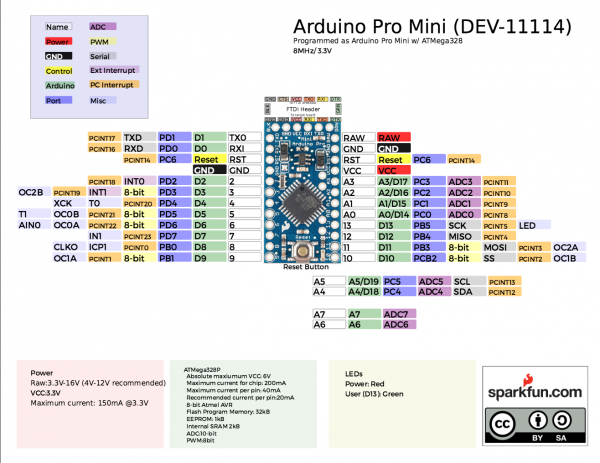 Heads are recognized as a 3rd Arduino in the list. The reason for 3 Arduinos thing is weird joystick related limitations of Windows – 7 axes, 32 buttons, and 2 hat switches. Some games support a larger number of buttons, some don’t, so that’s a workaround. Looking at the “uh1_head.ino” file that is uploaded it contains the comment “//WARNING! REMOVE LED ON PIN 13!” . Do you need to really remove the LED? Its removal is not referenced in the Manual on this page and I am not sure what impact it would have if it not removed… I did not even notice that warning, my mistake. So in my case the LED was left in place when I flashed the Pro Mini after enabling the serial port for testing with the Serial Monitor. When I tried to test the Head was connected to the Collective, which was connected to the Master and no other devices I was not seeing any Serial communications. I tried disabling the Serial, reflashing it and testing using the Windows Joystick Setup and the head did not work in that case either. But is did see that the Collective was working with it connected to it. I then noticed the warning and remove the LED and tried tested again in Windows and saw no difference. Enabled Serial, Reflashed and still saw no serial communications. 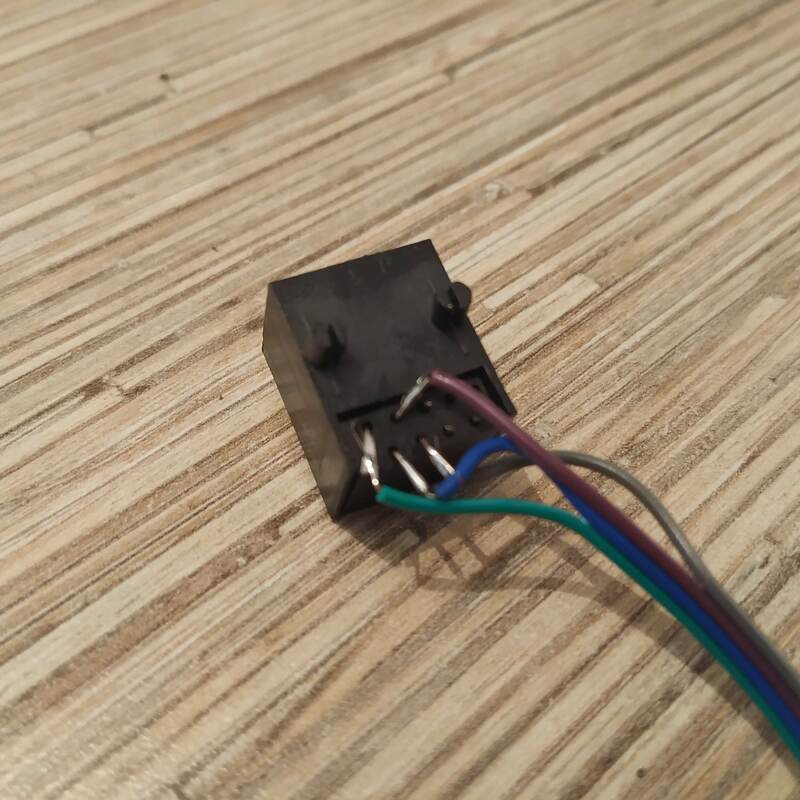 I looked at all my wiring in the head did not see any mistakes or shorts so I am at a loss and would like to know what the reason for removing the LED from PIN13 was. In the meantime, I plan to test again this evening with just the Head and Master to eliminate the potential issue of a short in the wiring that is inside the collective handle. While working on the head and its failed testing issues, I have been messing with everything else I have made and having a lot of fun with it. Thus far I have made the Reinforced Gimble that has a slightly different spring setup, the Stick, and Single Eng. Collective without a head… The rudder setup I am using is based off of an old Thurstmaster Setup where I just glued on the magnet and SS495A sensor in place of it’s original POT and used the source as is. I have been using it a bit and still have to address update the stick to address the twist when using single long bolts. All in all I am very pleased with how the project has come together. Thanks for all your efforts. The reason for removing led on pin 13 is simple – if you don’t remove it, the button you connect to it will be always pressed. However, the Huey head doesn’t use pin13, so it must have been copied from the 412 head =) Will fix that. 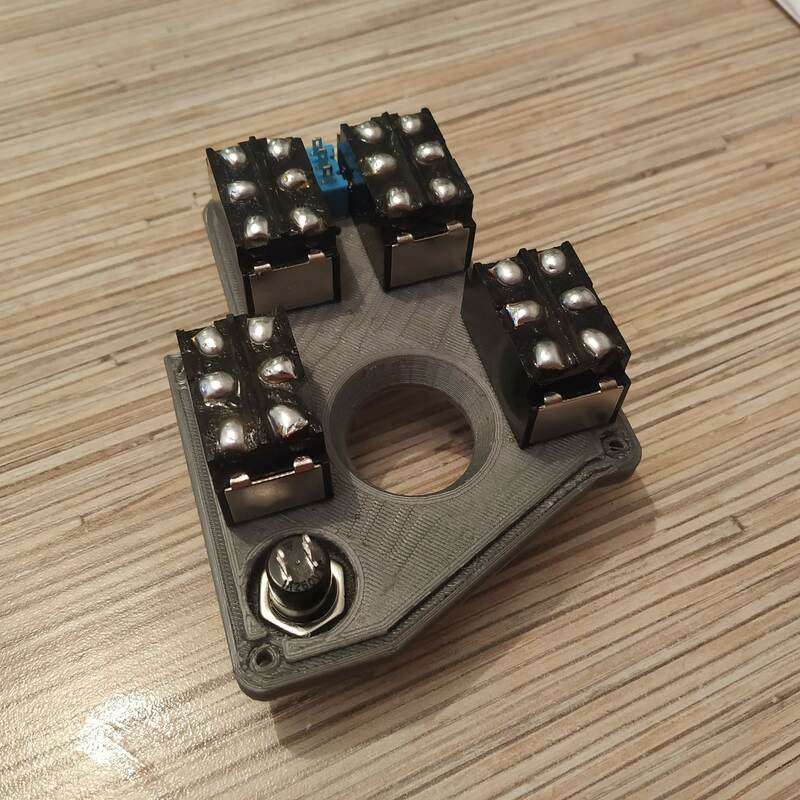 Are you sure you have not mistaken the order of SCL and SDA pins on the Pro Mini? A4 is SDA, A5 is SCL. As you have noticed, you could have accidentally damaged the cable that goes through the lever. 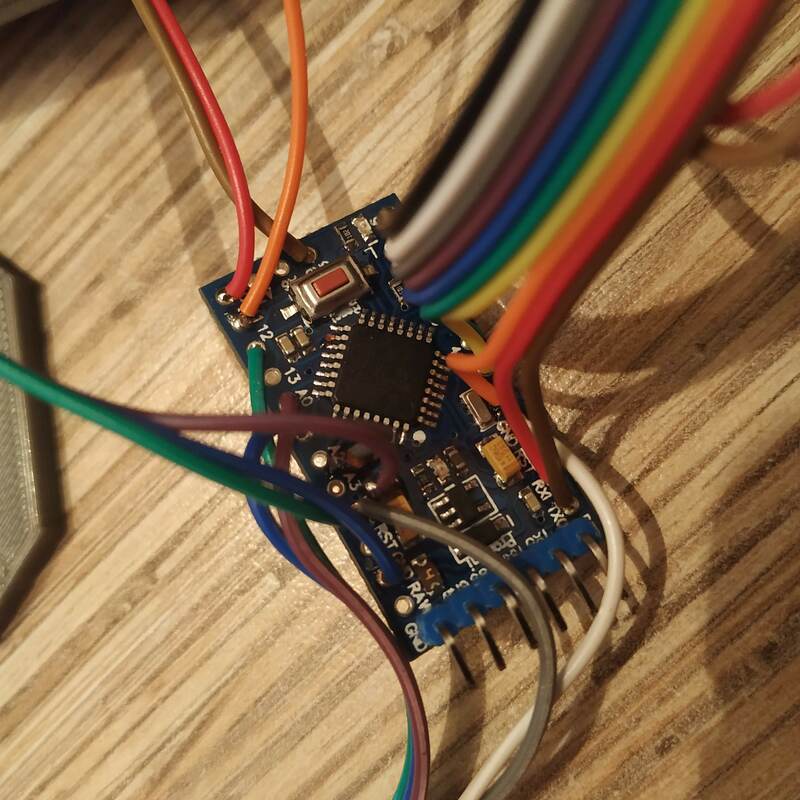 If the board flashed successfully, and you have uncommented Serial.begin and Serial.prints, the switch on pins 0 and 1 is centered, at least serial should work! Hi again, thanks for your help! 1) Check if there are any short circuits between any wires – there are none! I checked ALL wires at all possible spots. 2) Check if there are any short circuits between any of the IC2 wires. Checked at all possible locations. There IS current flowing when testing, but no short circuits. 5) Connected the head directly to the IC2 controller -> the Arduinos disappear from joy.cpl immediately. 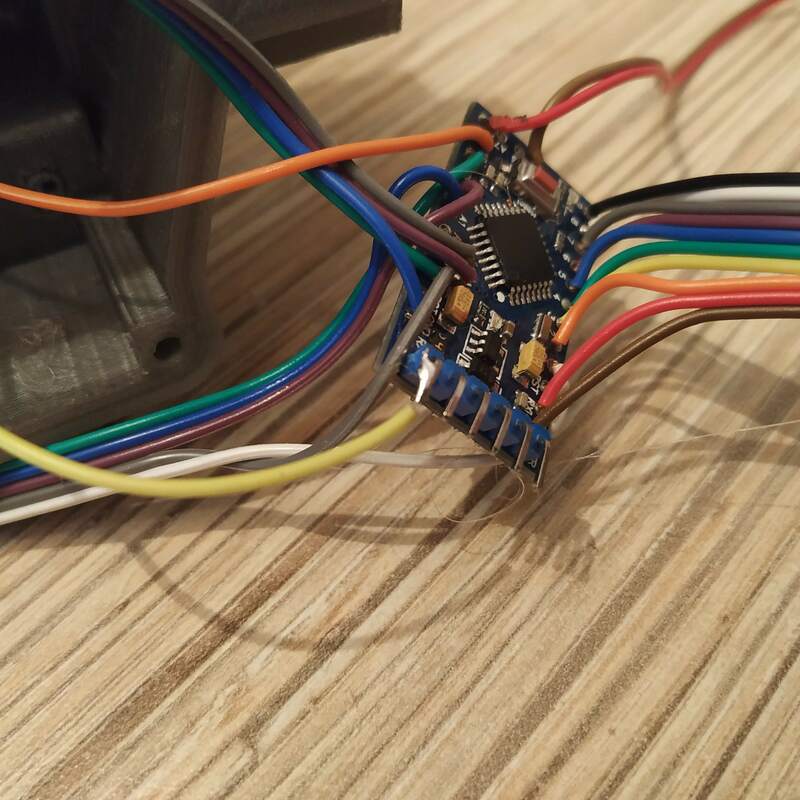 Remove the head, the Arduinos reappear after a while. 7) Connected head directly to the IC2 controller -> the Arduinos disappear from joy.cpl immediately. Remove the head, the Arduinos reappear after a while. So the result is the SAME! It does not matter if SCL/SDA Is correct or flipped! 8) Resoldered SCL/SDA to the correct points on the pro mini. 9) Redownloaded firmware for Huey head, reflashed, checked degubbing output in serial monitor (all switches and buttons work as expected), reflashed with Debug sections commented out. 10) Connected the head dirctely to the IC2 controller -> the Arduinos disappear from joy.cpl immediately. Remove the head, the Arduinos reappear after a while. 11) Redownloaded firmware for the IC master controller, reflashed, rebooted it. 12 ) Connected the head directly to the IC2 controller -> the Arduinos disappear from joy.cpl immediately. Remove the head, the Arduinos reappear after a while. 13) Connected the head to the collective and the collective to the IC2 controller -> the Arduinos disappear from joy.cpl immediately. Remove the head, the Arduinos reappear after a while. So whatever I do, the result is the same. I am pretty desperate at this point. The collective itself works fine. The head works in debugging mode but not when connected. What to do??? Are you sure you haven’t mistaken with the order of pins in the socket? When you plug the head in and joysticks disappear – it most likely may mean that Leonardo reboots due to reversed polarity of a connected device or a short circuit. The problem looks like a problem with socket – as the board itself works when connected to serial. Try taking a similar socket and checking which pin corresponds to which pin of the plug! 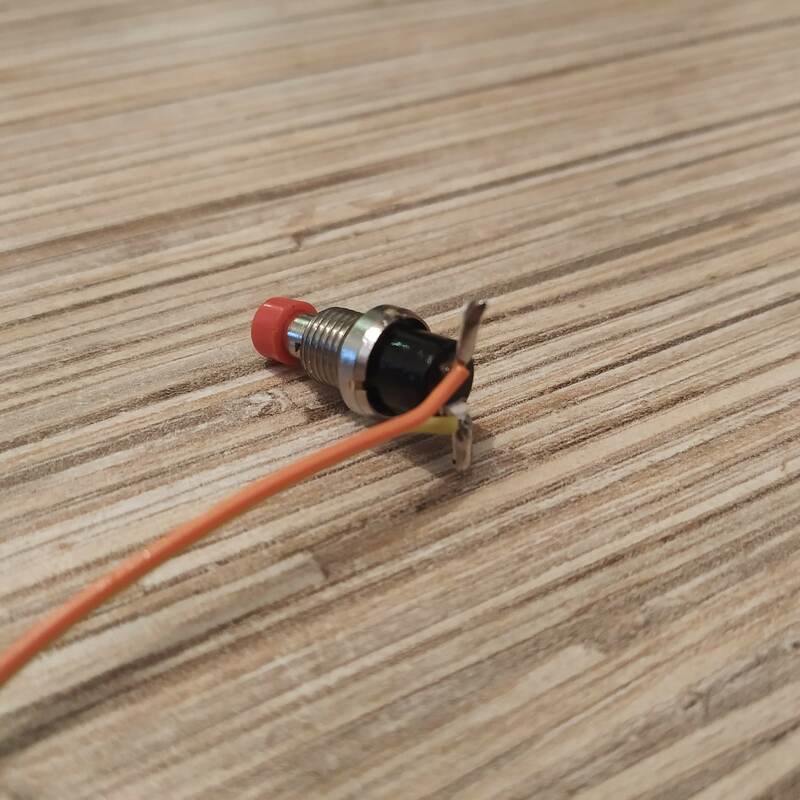 Or simply power the head through serial, and check that 1st pin of the socket where the orange-white wire of the plug goes has 5v on it, the second (orange) is GND. Third should be SCL (green-white), 4th(blue) – SDA. There’s also a possibility of a glitchy Pro Mini board, but it’s kinda unlikely. Don’t worry, everything will work, just need to pinpoint the problem. Thanks for your suggestions! It got me thinking. OK, after spending a lot of time thinking and staring at the ceiling while lying in bed, it occured to me that I check in great detail if there is current flowing, but not how MUCH. This is needed because of weird Windows limitations: joy.cpl only shows 1st 32 buttons of the joystick. The head uses 96 buttons! there are similar arrays for the Huey head in a_configuration.ino. Hello again! Thanks again for your help! But I finally managed to get nearly everything to work. Had to take apart the collective again (set up the pot deadzone wrong) and resolder everything in the collective base (some solder joints were wonky and I had some shorting issues). Did set up and calibrate the idle stop position in the config files. But I am still a bit puzzled on how it should work in DCS. The idle stop button works! But when I lower the throttle (on the collective) below “zero”, nothing happens. I still have to press “Page down” on my keyboard. It’S not a major issue, but I am scratching my head because of this. It all seems to be set up properly in the .ino files. Hi Peter! Thank you for a donation, really appreciate it! Looks like I have accidentally broken it in one of latest updates! Looking into it now. Due to how it is done in DCS, when the head is set to mode 0 (mode switch centered) when you turn throttle grip counterclockwise, it should send PgUp keypresses to the sim. Then, when you turn it below idle stop while holding the idle cutoff button, it sends PgDown presses. Will hopefully fix it today. Alternatively, just update and reflash the firmware – I have just pushed this fix to the repo. Btw, have you tried the pneumatic mod already? Wow, that was fast! I will make sure to try it this weekend! No, I do not plan on doing the pneumatic mod. 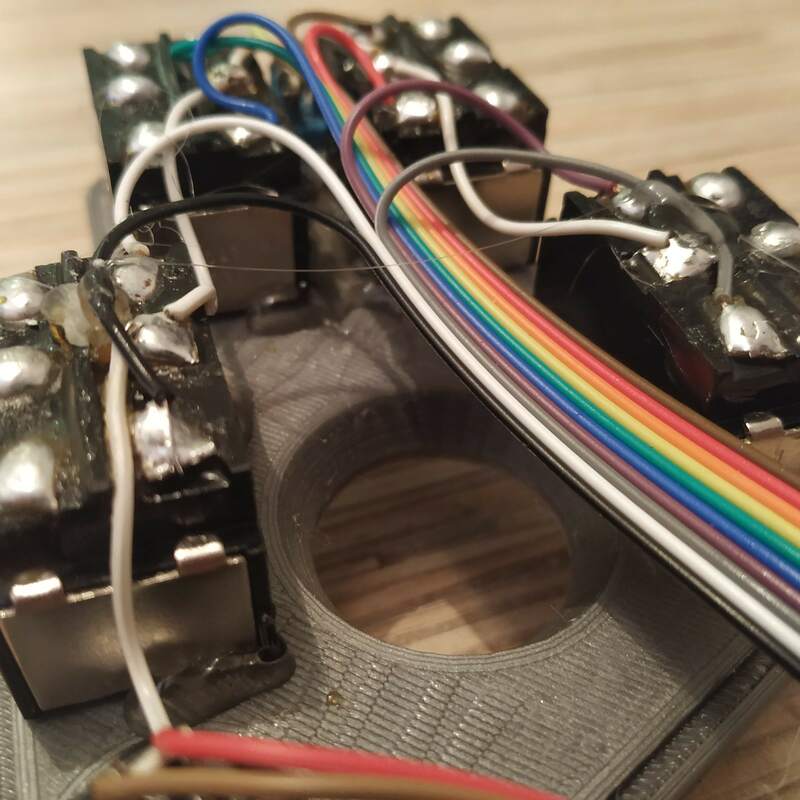 Instead I need to figure out a little connector piece to make the collective sit “higher”, because with my chair it is about 10-15cm too low, causing me back pain because when flying, I constantly have to lean left and down to reach it. The donation is just a little tip, considering the amount of time and work you put into this! Thanks again! I saw it, I got starry eyes, I felt a deep longing and love in my heart…. Haha…. We will see what will happen when I finally fix the collective height. Btw if you haven’t yet tried it, I strongly advise you to do it, it really is a game changer! It looks quite good on my MI A2 with BoboVR Z4. You are absolutely right about VR!! I am in the very lucky position of owning an Odyssey+ and loving it dearly. That thing is amazing! Before that I was lucky to own a Vive, which also was great for its time. Also, one has to remember, which of these 50 switches he’ve assigned for some function 5 days ago when he had a chance to fly for an hour. 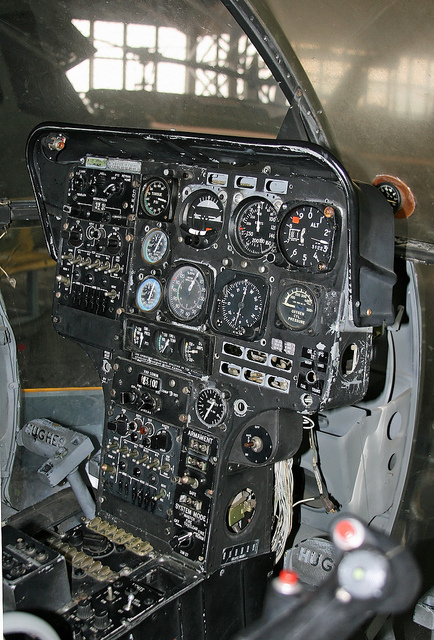 This is all a pain, so clickable cockpit is a big deal (also no one has enough switches to implement all of the circuit breakers, etc). So looking at the keyboard from your second link, I can imagine smth with say, 9 buttons, where buttons have a shape of a pyramid, e.g. your numpad, where 1 is the lowest button and 5 is the tallest one. It’s small enough so you can feel exactly what you fingers are over at the moment. 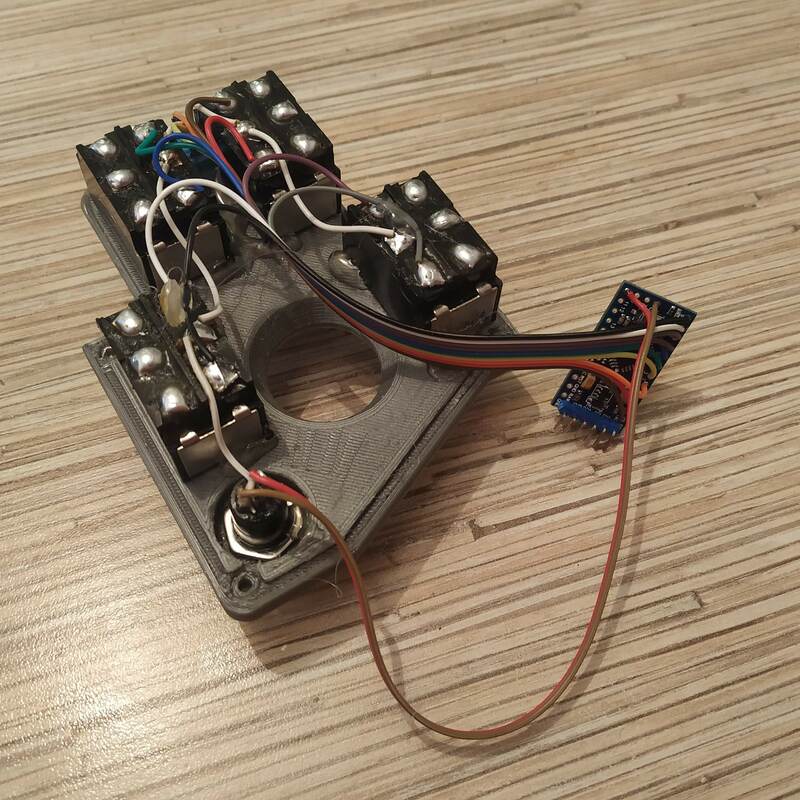 Also, I’ve seen a design of a realistic radio knob with 2 degrees of freedom and a button made from inexpensive incremental encoders and 3D printed parts. Maybe I will try designing something like this one day =) That is, speaking of pyrely VR-specific tactile thingies. The keyboard is great as it is for mimicking similar keyboards (I have no idea how these things are called lol!) in real fighters. Hi Cole! Sadly, can’t promise it soon enough, but I might do it in a couple of months. 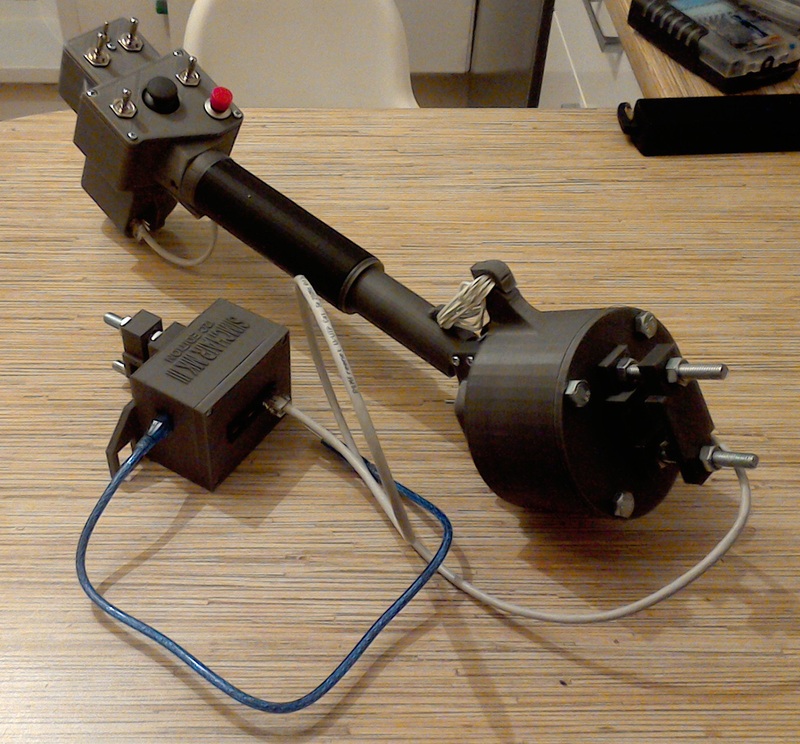 Next things on the list are pedals hot fix, a pneumatic mod for cyclic and Mi-8 controls. 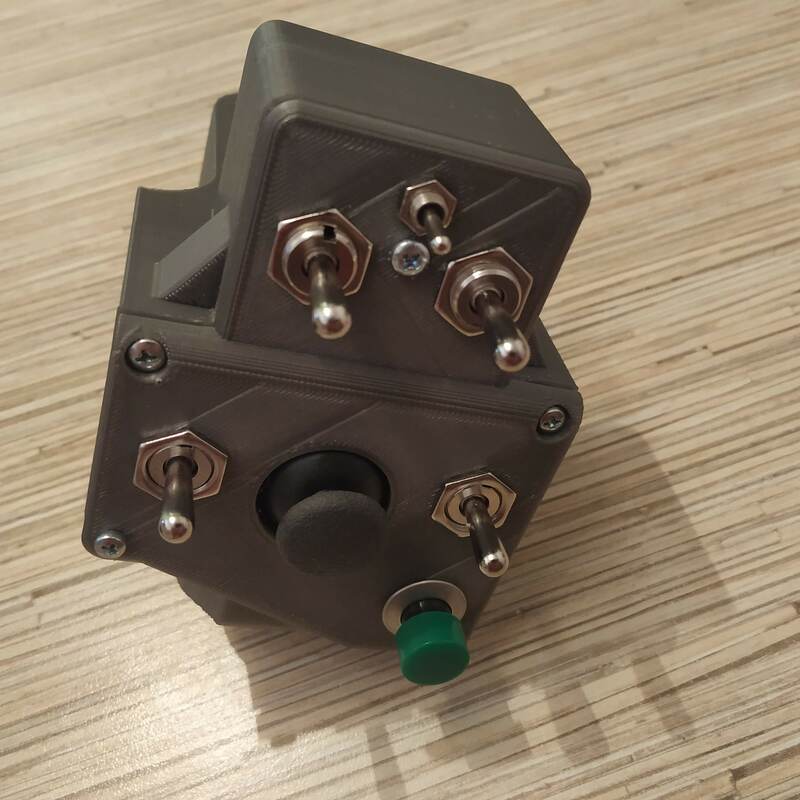 Meanwhile, you can use a combo of the single throttle lever and a 412 head with a stackable throttle quadrant – it will cover all your needs and its nice to have a throttle grip for flying other stuff! 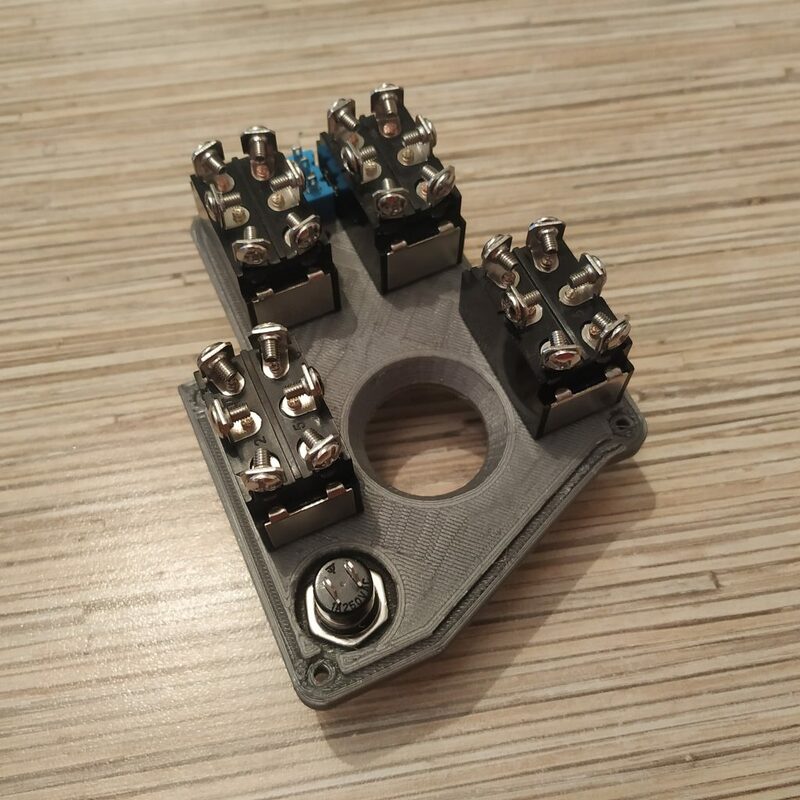 You may probably like the Mi-8 throttle quadrant as well. It looks like the head will only differ from the 412 in the shape of a plastic case!